I like test software so my computer installed many useful software, but after a while I forgot them, even did not use them very often, many software are out of current version, so I have to update new version for each one if I still want keep them. Today, I like introduce a web service that can help you to get some popular software, and keep them update once time in background. 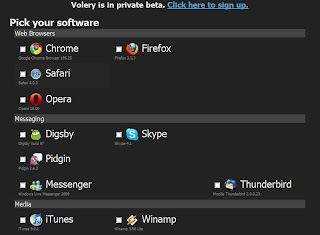 Volery is a useful internet service that can help you to get some software and keep update new version once time with hands free. Actually, you do not have to do anything after installed a Volery application. First, you have to register an account, it is a beta version so you have to require a demo code. If you do not have a demo code you can go here ask one. After you sign in, you can pick some software that you wanted, scroll down click "Get Installer" button. It will test and install these newest version software into your hard driver.It is very simple to use, and save a lot of time.